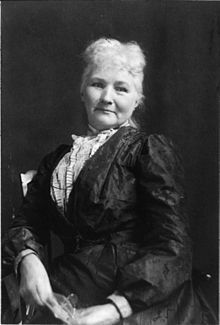 Mary G. Harris Jones (baptized 1837; died 1930), known as Mother Jones, was an Irish-born American schoolteacher and dressmaker who became a prominent organized labor representative, community organizer, and activist. She helped coordinate major strikes and co-founded the Industrial Workers of the World. Jones worked as a teacher and dressmaker, but after her husband and four children all died of yellow fever in 1867 and her dress shop was destroyed in the Great Chicago Fire of 1871, she became an organizer for the Knights of Labor and the United Mine Workers union. From 1897 onwards, she was known as Mother Jones. In 1902, she was called "the most dangerous woman in America" for her success in organizing mine workers and their families against the mine owners. In 1903, to protest the lax enforcement of the child labor laws in the Pennsylvania mines and silk mills, she organized a children's march from Philadelphia to the home of President Theodore Roosevelt in New York. 3 "March of the Mill Children"
Mary G. Harris was born on the north side of the city of Cork, Ireland, the daughter of Roman Catholic tenant farmers Richard Harris and Ellen (née Cotter) Harris. Her exact date of birth is uncertain; she was baptized on 1 August 1837. Mary Harris and her family were victims of the Great Famine, as were many other Irish families. This famine drove more than a million families, including the Harrises, to emigrate to North America when Mary was ten years old. Mary was a teenager when her family emigrated to Canada. In Canada (and later in the United States), the Harris family were victims of discrimination due to their immigrant status as well as their Catholic faith. Mary received an education in Toronto at the Toronto Normal School, which was tuition free and even paid a stipend to each student of one dollar per week for every semester completed. Mary did not graduate from the Toronto Normal School, but she was able to undergo enough training to occupy a teaching position at a convent in Monroe, Michigan, on 31 August 1859 at the age of 23. She was paid eight dollars per month, but the school was described as a "depressing place". After tiring of her assumed profession, she moved first to Chicago and then to Memphis, where in 1861 she married George E. Jones, a member and organizer of the National Union of Iron Moulders, which later became the International Molders and Foundry Workers Union of North America, which represented workers who specialized in building and repairing steam engines, mills, and other manufactured goods. Considering that Mary's husband was providing enough income to support the household, she altered her labor to housekeeping. The loss of her husband and their four children, three girls and a boy (all under the age of five) in 1867, during a yellow fever epidemic in Memphis marked a turning point in her life. After that tragedy, she returned to Chicago to begin another dressmaking business. She did work for those of the upper class of Chicago in the 1870s and 1880s. Then, four years later, she lost her home, shop, and possessions in the Great Chicago Fire of 1871. This huge fire destroyed many homes and shops. Jones, like many others, helped rebuild the city. According to her autobiography, this led to her joining the Knights of Labor. She started organizing strikes. At first the strikes and protests failed, sometimes ending with police shooting at and killing protesters. The Knights mainly attracted men but by the middle of the decade member numbers leaped to more than a million becoming the largest labor organization in the country. The Haymarket Riot of 1886 and the fear of anarchism and upheaval incited by union organizations resulted in the demise of the Knights of Labor when an anarchist threw a bomb into an altercation between the Chicago police and workers on strike. Once the Knights ceased to exist, Mary Jones became involved mainly with the United Mine Workers. She frequently led UMW strikers in picketing and encouraged striking workers to stay on strike when management brought in strike-breakers and militias. She believed that "working men deserved a wage that would allow women to stay home to care for their kids." Around this time, strikes were getting better organized and started to produce greater results, such as better pay for the workers. Another source of her transformation into an organizer, according to biographer Elliott Gorn, was her early Roman Catholicism and her relationship to her brother, Father William Richard Harris. He was a Roman Catholic teacher, writer, pastor, and dean of the Niagara Peninsula (in St. Catharines, Ontario) in the Diocese of Toronto, who was "among the best-known clerics in Ontario", but from whom she was reportedly estranged. [page needed] Her political views may have been influenced by the 1877 railroad strike, Chicago's labor movement, and the Haymarket riot and depression of 1886. Jones was ideologically separated from many female activists of the pre-Nineteenth Amendment days due to her aversion to female suffrage. She was quoted as saying that "you don't need the vote to raise hell!" She opposed many of the activists because she believed it was more important to liberate the working class itself. When some suffragettes accused her of being anti-women's rights she clearly articulated herself, "I'm not an anti to anything which brings freedom to my class." She became known as a charismatic and effective speaker throughout her career. She was an exceptionally talented orator. Occasionally she would include props, visual aids, and dramatic stunts for effect. Her talks usually involved the relating of some personal tale in which she invariably "showed up" one form of authority or another. It is said Mother Jones spoke in a pleasant-sounding brogue which projected well. When she grew excited, her voice did not grow shrill. Instead, it dropped in pitch, and her intensity became all but palpable. By age 60, she had assumed the persona of "Mother Jones" by claiming to be older than she was, wearing outdated black dresses and referring to the male workers that she helped as "her boys". The first reference to her in print as Mother Jones was in 1897. "March of the Mill Children"
In 1901, workers in Pennsylvania's silk mills went on strike. Many of them were young women demanding to be paid adult wages. The 1900 census had revealed that one sixth of American children under the age of sixteen were employed. John Mitchell, the president of the UMWA, brought Mother Jones to north-east Pennsylvania in the months of February and September to encourage unity among striking workers. To do so, she encouraged the wives of the workers to organize into a group that would wield brooms, beat on tin pans, and shout "join the union!" She felt that wives had an important role to play as the nurturers and motivators of the striking men, but not as fellow workers. She claimed that the young girls working in the mills were being robbed and demoralized. The rich were denying these children the right to go to school in order to be able to pay for their own children's college tuitions. To enforce worker solidarity, she traveled to the silk mills in New Jersey and returned to Pennsylvania to report that the conditions she observed were much better. She stated that "the child labor law is better enforced for one thing and there are more men at work than seen in the mills here." In response to the strike, mill owners also divulged their side of the story. They claimed that if the workers still insisted on a wage scale, they would not be able to do business while paying adult wages and would be forced to close. Even Jones herself encouraged the workers to accept a settlement. Although she agreed to a settlement that sent the young girls back to the mills, she continued to fight child labor for the rest of her life. As Mother Jones noted, many of the children at union headquarters were missing fingers and had other disabilities, and she attempted to get newspaper publicity for the bad conditions experienced by children working in Pennsylvania. However, the mill owners held stock in most newspapers. When the newspaper men informed her that they could not publish the facts about child labor because of this, she remarked "Well, I've got stock in these little children and I'll arrange a little publicity." Permission to see President Roosevelt was denied by his secretary, and it was suggested that Jones address a letter to the president requesting a visit with him. Even though Mother Jones wrote a letter asking for a meeting, she never received an answer. Though the president refused to meet with the marchers, the incident brought the issue of child labor to the forefront of the public agenda. The 2003 non-fiction book Kids on Strike! described Jones's Children's Crusade in detail. During the Paint Creek–Cabin Creek strike of 1912 in West Virginia, Mary Jones arrived in June 1912, speaking and organizing despite a shooting war between United Mine Workers members and the private army of the mine owners. Martial law in the area was declared and rescinded twice before Jones was arrested on 13 February 1913 and brought before a military court. Accused of conspiring to commit murder among other charges, she refused to recognize the legitimacy of her court-martial. She was sentenced to twenty years in the state penitentiary. During house arrest at Mrs. Carney's Boarding House, she acquired a dangerous case of pneumonia. After 85 days of confinement, her release coincided with Indiana Senator John W. Kern's initiation of a Senate investigation into the conditions in the local coal mines. Mary Lee Settle describes Jones at this time in her 1978 novel The Scapegoat. Several months later, she helped organize coal miners in Colorado. Once again she was arrested, served some time in prison, and was escorted from the state in the months prior to the Ludlow Massacre. After the massacre, she was invited to meet face-to-face with the owner of the Ludlow mine, John D. Rockefeller Jr. The meeting prompted Rockefeller to visit the Colorado mines and introduce long-sought reforms. Jones was denounced on the floor of the U.S. Senate as the "grandmother of all agitators". Jones remained a union organizer for the UMW into the 1920s and continued to speak on union affairs almost until she died. She released her own account of her experiences in the labor movement as The Autobiography of Mother Jones (1925). During her later years, Jones lived with her friends Walter and Lillie May Burgess on their farm in what is now Adelphi, Maryland. She celebrated her self-proclaimed 100th birthday there on 1 May 1930 and was filmed making a statement for a newsreel. Mother Jones attempted to stop the miners' from marching into Mingo County in late August 1921. Mother Jones also visited the governor and departed assured he would intervene. Jones opposed the armed march, appeared on the line of march and told them to go home. In her hand she claimed to have a telegram from President Warren Harding offering to work to end the private police in West Virginia if they returned home. When UMW president Frank Keeney demanded to see the telegram, Mother Jones refused and he denounced her as a 'fake'. Because she refused to show anyone the telegram she was suspected of having fabricated the story. Mother Jones refused to allow anyone to read the document, and the President's secretary denied ever having sent one. After she fled the camp, she reportedly suffered a nervous breakdown. Mother Jones was joined by Keeney and other UMWA officials who were also pressuring the miners to go home. Although Mother Jones organized for decades on behalf of the UMWA in West Virginia and even denounced the state as 'medieval', the chapter of the same name in her autobiography, she mostly praises Governor Morgan for defending the First Amendment freedom of the labor weekly The Federationist to publish. His refusal to consent to the mine owners request he ban the paper demonstrated to Mother Jones that he 'refused to comply with the requests of the dominant money interests. To a man of that type I wish to pay my respects'. Apparently Jones did not know or overlooked that Morgan had received about $1 million in campaign donations from industrialists in the 1920 election. Mary Harris Jones died in Silver Spring, Maryland, at the age of 93 years on 30 November 1930. There was a funeral Mass at St. Gabriel's in Washington, D.C.
She is buried in the Union Miners Cemetery in Mount Olive, Illinois, alongside miners who died in the 1898 Battle of Virden. She called these miners, killed in strike-related violence, "her boys." In 1932, about 15,000 Illinois mine workers gathered in Mount Olive to protest against the United Mine Workers, which soon became the Progressive Mine Workers of America. Convinced that they had acted in the spirit of Mother Jones, the miners decided to place a proper headstone on her grave. By 1936, the miners had saved up more than $16,000 and were able to purchase "eighty tons of Minnesota pink granite, with bronze statues of two miners flanking a twenty-foot shaft featuring a bas-relief of Mother Jones at its center." On 11 October 1936, also known as Miners' Day, an estimated 50,000 people arrived at Mother Jones's grave to see the new grave stone and memorial. Since then, October 11 is not only known as Miners' Day but is also referred to and celebrated in Mount Olive as "Mother Jones's Day." Jones uttered words still invoked by union supporters more than a century later: "Pray for the dead and fight like hell for the living." Already known as "the miners' angel" when she was denounced on the floor of the United States Senate as the "grandmother of all agitators", she replied, "I hope to live long enough to be the great-grandmother of all agitators." In 1984, she was inducted into the National Women's Hall of Fame. The imprisonment of "Mother" Jones is commemorated by the State of West Virginia through a Historic Highway marker. The marker was made by the West Virginia Division of Culture and History. The marker reads, "PRATT. First settled in the early 1780s and incorporated in 1905. Important site in 1912-13 Paint-Cabin Creek Strike. Labor organizer 'Mother Jones' spent her 84th birthday imprisoned here. Pratt Historic District, listed on the National Register in 1984, recognizes the town's important residential architecture from early plantation to Victorian Styles." The marker is located in the town of Pratt, right off of West Virginia 61. "The most dangerous woman," a spoken-word performance by indie folk singer/spoken word performer Utah Phillips with music and backing vocals added to it by indie folk artist Ani Difranco, can be found on their collaborative album Fellow Workers. The title refers to the moniker that a West Virginia District Attorney Reese Blizzard gave to Mother Jones, referring to her as "the most dangerous woman in America." Utah Phillips performed the song "The Charge on Mother Jones." This folk song was written by William M. Rogers. In Uncle by J. P. Martin, a train line is called Mother Jones's Siding and is rumoured to be run by Mother Jones herself. The play "Can't Scare Me...the Story of Mother Jones" is written and performed by actress, playwright, and professor, Kaiulani Lee. It premiered at the Atlas Theater in Washington D.C. in 2011 and has been performed all over the United States at universities, union gathers, and more! Kaiulani Lee also took the show on tour with The United Mine Workers across Colorado as well as tours in Ireland, Bangladesh, and Cambodia. Victory at Arnot is a work for chamber group and narrator by composer Eleanor Aversa. It recounts how Mother Jones assisted with the coal miners' strike in 1899–1900 in Arnot, PA, and celebrates the power of non-violent resistance. The piece premiered in Philadelphia in 2016 and was followed by performances in Boston. ^ "Mother Jones (1837–1930)". AFL-CIO. Retrieved 30 November 2012. ^ a b Sandra L. Ballard; Patricia L. Hudson (18 July 2013). Listen Here: Women Writing in Appalachia. University Press of Kentucky. ISBN 978-0-8131-4358-3. Retrieved 26 September 2013. ^ "The Autobiography of Mother Jones 1925"
^ Gorn 2002, p. 74. ^ "Mother Jones leading a protest, circa 1903". Explore PA History. Retrieved 30 November 2015. ^ a b "Today in labor history: Mother Jones leads march of miners' children". People's World. 21 September 2012. Retrieved 30 November 2015. ^ Jones, Mother (1925). "Chapter Ten: The March of the Mill Children". In Parton, Mary Field (ed.). The Autobiography of Mother Jones. Chicago: Charles H. Kerr & Company. Retrieved 30 November 2015. ^ Watson, William E.; Jr, Eugene J. Halus (25 November 2014). "Irish Americans: The History and Culture of a People: The History and Culture of a People". ABC-CLIO – via Google Books. ^ Jones, Mother (1925). Parton, Mary Field (ed.). The Autobiography of Mother Jones. Chicago: Charles H. Kerr & Company. Retrieved 30 November 2015. ^ "Mother Jones in Talkie; Friend of Labor Celebrates 100th Birthday at the Microphone". The New York Times. 12 May 1930. ^ Savage, Lon (1990). Thunder in the Mountains: The West Virginia Mine War 1920–21 (1985 ed.). Pittsburgh: University of Pittsburgh Press. pp. 78–79. ^ Mother Jones (2004). The Autobiography of Mother Jones (1925 ed.). Chicago: Charles Kerr. p. 144. ^ Green, James (2015). The Devil is Here in These Hills: West Virginia's Coal Miners and Their Battle for Freedom,. NY: Atlantic Monthly Press. p. 218. ^ Obituary for Mother Mary Jones, The Washington Post, 2 December 1930, pg. 3. ^ "United States Department of Labor – Labor Hall of Fame: Mary Harris "Mother" Jones". Dol.gov. Archived from the original on 17 February 2011. Retrieved 6 September 2010. ^ Gorn 2002, p. 297. ^ "Quotations from Mother Jones (#2)". Retrieved 14 October 2011. ^ Silas House (2009). Something's Rising: Appalachians Fighting Mountaintop Removal. University Press of Kentucky. p. 62. ISBN 9780813173412. ^ "'Pray for the dead and fight like hell for the living'". ^ "Mother Jones Remembered". Retrieved 17 March 2012. ^ "Mother Jones festival begins today!". 29 July 2014. ^ "Participate, Challenge, Community…Through Film - frameworksfilms.com". frameworksfilms.com. ^ State of West Virginia (2002). Marking Our Past: West Virginia's Historical Highway Markers. Charleston: West Virginia Division of Culture and History. p. 70. ^ Spiegel, Max. "THE CHARGE ON MOTHER JONES". ^ Denselow, Robin (23 December 2010). "Andy Irvine: Abocurragh – review" – via www.theguardian.com. ^ "♫ Dishpan Brigade - Wishing Chair and Kara Barnard. Listen @cdbaby". ^ "Blossburg: William Bauchop Wilson: United Mine Workers of America". www.blossburg.org. ^ "Can't Scare Me". Kaiulani Lee. ^ "New York Musical Festival :: 2014 Events". nymf.org. ^ "Brooklyn Publishers - NEVER CALL ME A LADY". www.brookpub.com. ^ "Review in Boston Irish Times". Corbin, David (2011). Gun Thugs, Rednecks, and Radicals: A Documentary History of the West Virginia Mine Wars. Oakland: PM Press. Savage, Lon (1990). Thunder in the Mountains: The West Virginia Mine War, 1920–21. Pittsburgh: University of Pittsburgh Press. State of West Virginia (2002). Marking Our Past: West Virgnia's Historical Highway Markers. Charleston: West Virginia Division of Culture and History. Edward M. Steel, "Mother Jones in the Fairmont Field, 1902", Journal of American History 57, Number 2 (September, 1970) pages 290-307. Michals, Debra. "Mary Harris Jones". National Women's History Museum. 2015.